The albergue we stayed at last night was lovely - very modern, and the owner really made an effort to make it a bit of a haven for the peligrinos. Great supper and a nice terraced area. 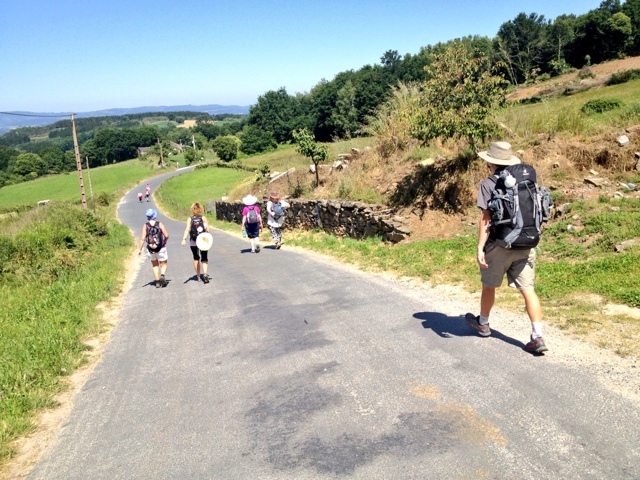 The door to our room overlooked the Camino, and this morning we immediately realised that the masses of walkers starting from Sarria (the first big town before the 100km mark) meant the final distance to Santiago would be rather busy. Up until now we've had people passing us every so often, but it has been pretty easy to have some peace and quiet to walk along in relative solitude. Now we found that there would be a group of four to six people every 20-30 metres. I realised that it felt just like turning up at St. Jean Pied-de-Port at the start of the month (685km back), where I walked through the St. Jacques Gate after a week of walking on my own and was confronted by lots of people in brand new walking shoes, packs, etc. 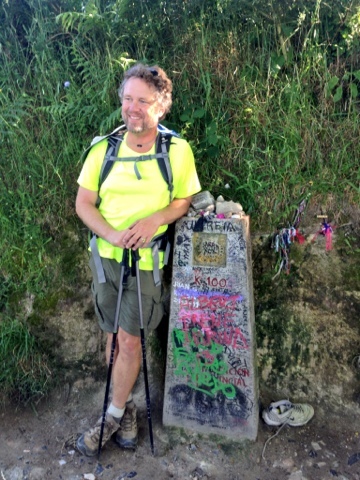 with everyone saying they were also doing the Camino too. Pah! 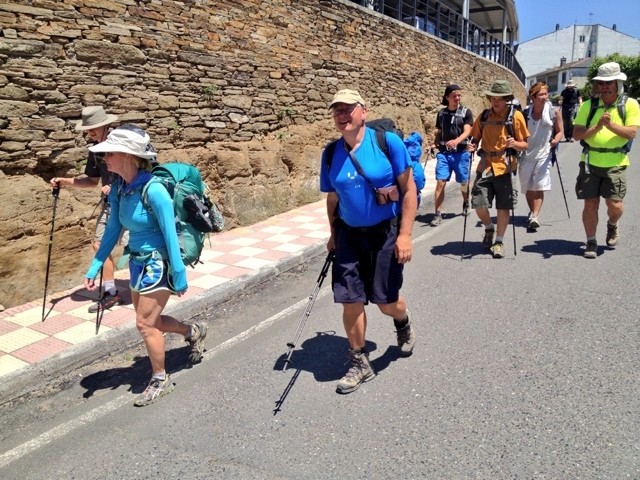 What was weirder was the large groups of people wearing matching tops, clearly doing the last five days of the Camino as some sort of ghastly group activity. Connor dubbed the matching tops the 'Green Shirts of Sloth'. They were even having their bags carried by Jacotrans - double pah and extra lashings of humbug. A small ritual has developed in our group, with the boys regularly ordering too much food, much to Kurt's continued annoyance. But Rupert is a reliable hoover-upper of leftovers, and yesterday - after Kim had been having a go at Connor about being so wasteful - Rupert finished off the fairly large amount of leftover bocadillo with gusto, and once he'd downed the last part he guiltily asked Kim if he'd done the right thing in finishing off the boy's food. Today things had moved on, and Connor simply passed Rupert the remains of his sandwich. 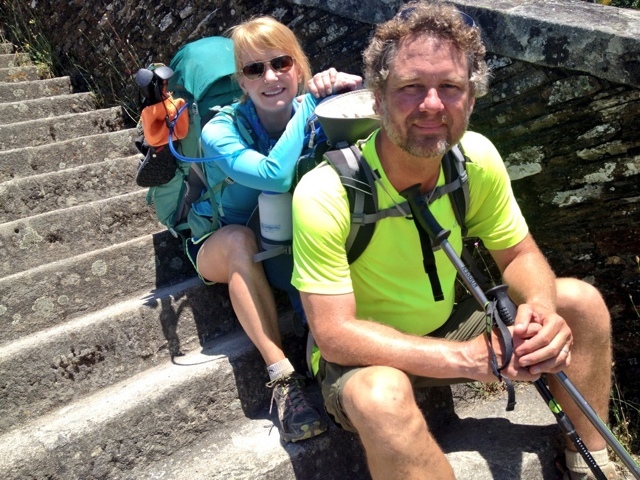 They're an efficient pair - well suited to walking the Camino together! For the last week we've been leapfrogging a school group from Washington - Potomac College, or something. They are all 17 years old, with a couple of teachers to make sure they don't go off the rails, but the children seem fairly well behaved, so I really don't think supervision is all that necessary. To be honest they seem a little tame. I know that when we had our school expeditions the aim was usually to break rules and buy things we shouldn't have. This does not seem to be a problem with these guys though, and they seem to march along in a fairly tight unit with nothing wilder than a fizzy drink or two in their backpacks - we refer to them as Team America. Anyway they are all fairly sociable when you engage them, but not the sort of kids who seem to have made any friends outside their group, or even really wave and say hello to other people who they've been bumping into for the last few hundred kilometres - us, for example. So today we passed them when they were having a coffee break, and we yelled out 'Good Morning', as is the Camino custom when you see people you recognise. Not a flinch from any of them, and likewise nothing when Kim became more animated. As we wandered on we decided that at our next break we'd give them a bit of a rev, and worked on a cheerleading chant to perk them into life. As we sank our cold drinks (too got for coffee, alas) we finessed our routine, and when each of their pairs passed by we launched into a rousing 'P-O, P-O-T, P-O-T-O-M-A-C, Go Potomac! Go Go Potomac!' One of the guys smiled at us, two of the girls raised their arms in victory salutes, and the reactions of the rest of them suggested that we could have been singing the Internationale for all they cared. Triple pah. 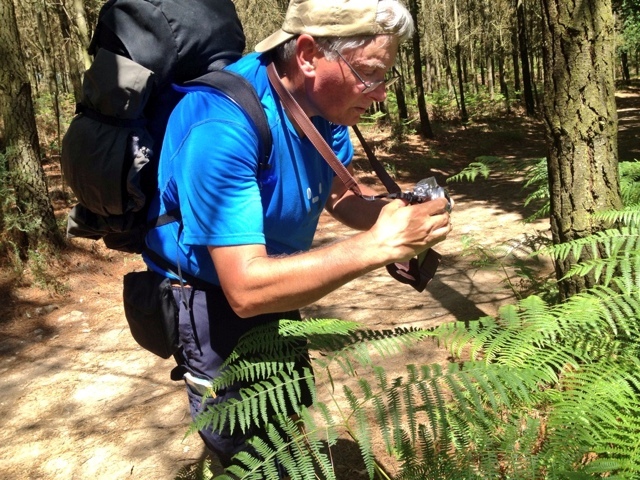 We covered 28km or so today, with the last part in the heat of the afternoon, albeit with a smattering of shade from the trees that lined the route, and some sections of forest. I think the day did take it out of Rupert a bit, and we're aiming to start a little earlier tomorrow. He went to bed early and is currently doing his 'I'm Being Chased By A Monster But If I Snore Really Loudly It'll Go Away' snore. I've had a very laid back evening in the albergue's courtyard talking to Nikolaus, a recently retired lawyer from Germany, who I met on the day between Roncesvalles and Arre - almost a month back! We had a very German table before supper as there was also Emma, and her grandmother Helga - both lovely people.